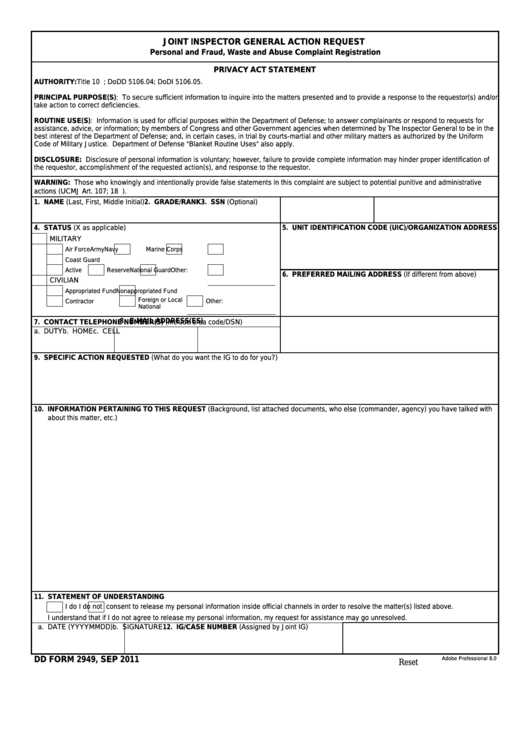 Download a blank fillable Dd Form 2949 - Joint Inspector General Action Request in PDF format just by clicking the "DOWNLOAD PDF" button. Complete Dd Form 2949 - Joint Inspector General Action Request with your personal data - all interactive fields are highlighted in places where you should type, access drop-down lists or select multiple-choice options. AUTHORITY: Title 10 U.S.C. 141; DoDD 5106.04; DoDI 5106.05.
take action to correct deficiencies. Code of Military Justice. Department of Defense "Blanket Routine Uses" also apply. the requestor, accomplishment of the requested action(s), and response to the requestor. actions (UCMJ Art. 107; 18 U.S.C. 1001). I do not consent to release my personal information inside official channels in order to resolve the matter(s) listed above. I understand that if I do not agree to release my personal information, my request for assistance may go unresolved.